Acting Police Chief Bill Conger has accepted a permanent position as the head of the police department. But Conger, who was hired part time to fill the position temporarily in March, will not be given the position of police chief. In fact, he won’t even be employed by the city. Conger will be working for a California-based company, Strategic Contracting Solutions, which the city will hire to provide it with Conger’s services as a law enforcement administrator. Conger’s title will be chief of police administration, and the city position of police chief will remain open for the duration of his employment. “He’d technically be working for a private-sector company. That’s the book work on it,” City Manager David Fraser said Monday. The arrangement is necessary because Conger, who retired as Metropolitan Police Department’s deputy chief in 2005, is drawing retirement benefits from the Public Employees’ Retirement System of Nevada, Fraser said. If Conger was hired by the city full time, he would no longer be able to draw his retirement benefits, and the pay from the city would be less than his retirement pay. “If we hired (Conger) directly, and hired him on a full-time basis, his retirement would be affected negatively,” said Bryce Boldt, city personnel administrator. It is an unusual arrangement, but not unprecedented in Nevada, Fraser said. PERS was contacted and cleared the arrangement, Fraser said. The city will pay Conger’s employer an annual fee of $114,600, the entry-level compensation for the police chief in Boulder City, plus an additional 20 percent in taxes and fees, Boldt said. Compared with hiring a chief, the arrangement saves the city about $30,000 because it does not have to pay Conger’s benefits. “I’m not doing this to save $30,000, but it doesn’t hurt,” Fraser said. On paper, Conger’s position will change Sept. 19. The transition will be “seamless,” Fraser said. Although Conger has been paid as a part-time employee as acting chief, he has been working five days a week, he said. The only thing that will be different is that he will be a private-sector employee and not a peace officer, so he will not be able to make arrests or serve warrants. But he doesn’t do that anyway, because it’s not a chief’s job, he said. Fraser said he will continue to have authority over Conger and the police department, as he does now. Since joining the department in March, Conger has done “a great job,” particularly in his work updating policies and working to improve morale issues, Fraser said. When Conger arrived in Boulder City, an independent police department audit had recently been completed, showing a long list of staffing, organizational, communication and policy problems. “I think he brought the kind of credibility to that office it needed both inside and outside,” Fraser said. 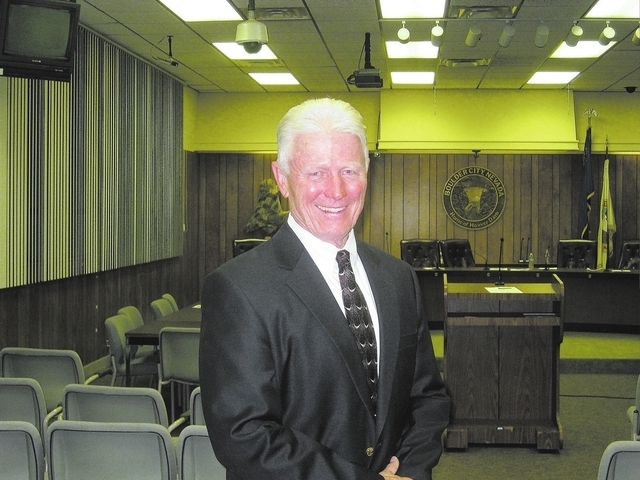 Conger worked as a law enforcement consultant in the years since retiring from Metropolitan Police Department. He was hired as acting chief in March to fill the position left open by Thomas Finn, who was on an extended medical leave. And now that he has had an opportunity to work with the department, which he says has the potential to be “the best small department in the West,” he says he’d like to continue working in Boulder City. “I’m having as much fun as I’ve had in 32 years of police work,” he said. But that’s not to say there aren’t challenges. Conger said the biggest challenge facing the department is the lack of internal communication. Conger declined to comment on what he sees as crime-related challenges in Boulder City, because he did not want to tip off any criminals. “I’m more of ‘when we hit ’em, let’s surprise ’em,’ ” he said. Conger, a Vietnam veteran who spent six years as a helicopter pilot in the Army, joined Metropolitan Police in 1975. After retiring in 2005, he was one of 16 candidates who ran for Clark County sheriff in 2006. Conger would not specify how long he planned on working in Boulder City, but he assured the Boulder City Review he was not planning on running for sheriff again next year. Current Clark County Sheriff Doug Gillespie announced last month he would not seek re-election. Conger was also one of three finalists for Henderson police chief last year. Reporter Jack Johnson can be contacted at jjohnson@bouldercityreview.com or 702-586-9523.